Sir James Wilson Vincent Savile OBE KCSG. RIP. Most of us in Leeds loved Jimmy Savile and we were saddened by his death. It won't be the same on the roads and in the restaurants of Roundhay without seeing him around. There were many people talking about him on the day he died and I was interested to see whether his name was trending on twitter. I quickly discovered that one of the reasons his name wasn't trending as much as I would have expected was that many people, including (rather surprisingly) BBC Look North's Facebook Page, were spelling it incorrectly: Saville rather than Savile. It's an easy - and common - mistake to make but one that has irked me a little over the years. In order to make amends, I tweeted. I used the hashtags #jimmysavile and #jimmysaville because they were both being used in other tweets. As you can see, it's clear from the content of my message that I know how to spell his name correctly. While I was looking at the trends, one tweet I came across asked a question. I replied with an explanation. A pretty straightforward answer as far as I can see. But it yielded a somewhat predictable reply. OK. In all fairness he's making a point in what appears to be good humour. After all, no one likes a smart arse. I didn't reply since antagonism is something I try to avoid. In my defence, however, I would argue that I tweeted in order to help the correct spelling of Jimmy's name to trend rather than the incorrect one. And to give an honest, clear answer to the question he posed. I'm pleased to say that JimmySavile did start trending eventually. So all's well that ends well. Or so I thought. A little later he tweeted again. Hmm. Charming. Nevertheless an admirable example of defence via attack. I'd like to know how he comes to that conclusion. I refer, of course, to my alleged misspelling, not to my state of mind. Though I think I'd be right in claiming that I'm neither of the names he called me. Anyway, once more I didn't reply as I guessed it would just develop into a playground argument (didn't, did, didn't, did, etc) and prompt more name calling. At the time of writing, he hasn't tweeted again. I'd like to think (but I don't know) that he's realised his error and has been shamed into silence. 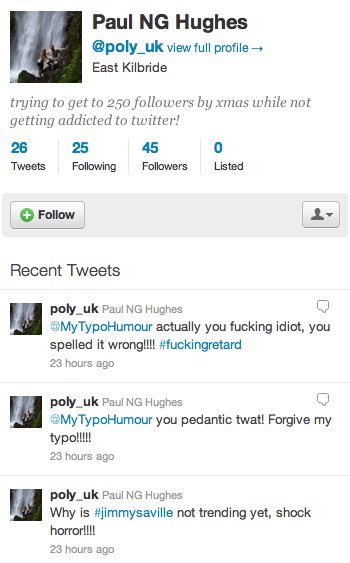 So, if you come across Paul NG Hughes of East Kilbride, aka @poly_uk on twitter, please say Hi to him from me. And you're welcome to elucidate him on my behalf. In the most polite way possible, of course.